I GREW UP SHOPPING for clothes from the sales racks at JC Penney. Rarely, if ever, was I allowed to buy anything from the full price rack. So why bother to look. Because I was the oldest girl in the family, I got the new clothes, which were then passed down to my ungrateful sister. I use that adjective because Lanae didn’t especially appreciate my fashion taste. She was right. My indecisiveness often led to bad choices. By my middle school years, I learned to sew. And from then on, I stitched most of my apparel. I didn’t mind. I loved selecting patterns and fabrics and creating one-of-a-kind clothing. Still, mostly, it was all about saving money. And money was tight in our poor farm family of six kids. 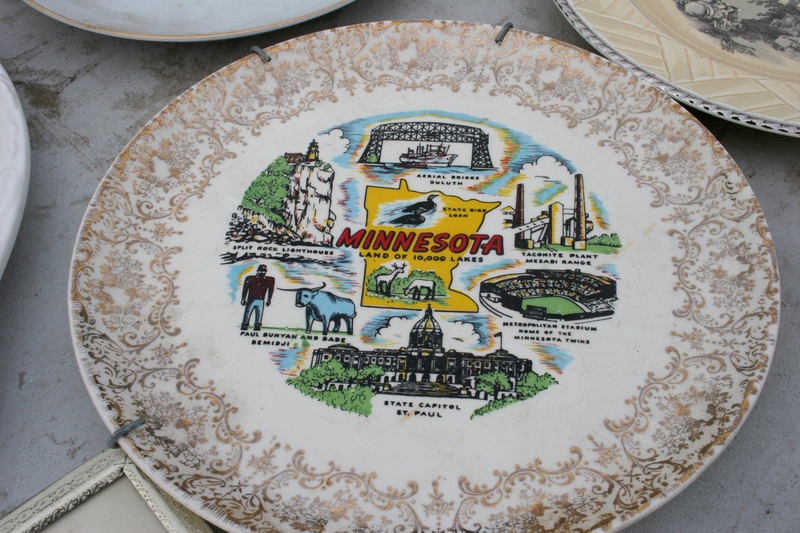 I found this vintage Minnesota beverage tray at the recent Rice County Steam & Gas Engines Flea Market. All other items featured in this post were found at the same venue. With that background, you can understand my delight in seeking out and scoring bargains. Thrift stores, yard and garage sales, and flea markets are my favorite shopping venues. Not only can I find merchandise at affordable prices, but I typically discover something few others own. 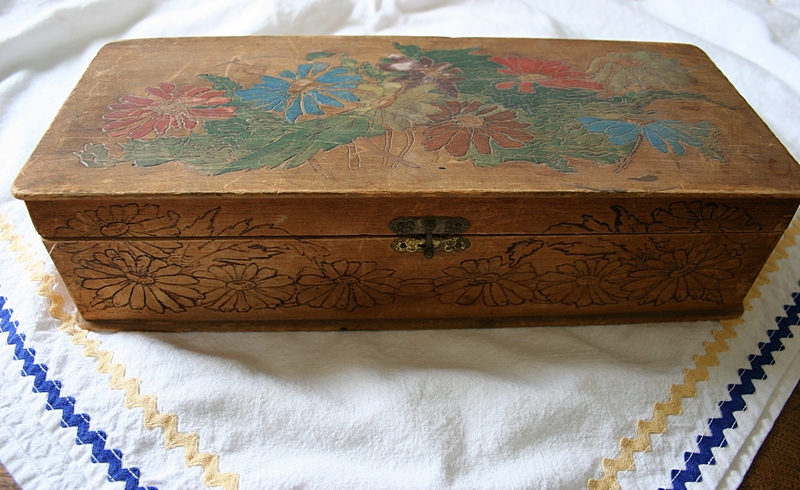 At the same vendor where I purchased the tray, I found this floral etched and painted box. If I remember correctly, this is “hobo art.” I got the box and the tray for $12. These may be given as gifts; I haven’t decided. I’ve passed this love of bargain shopping onto my three offspring. My 19-year-old college intern son, attempting to furnish his first apartment on a budget, recently negotiated the purchase of a leather couch for $25 at a Goodwill store in Rochester. 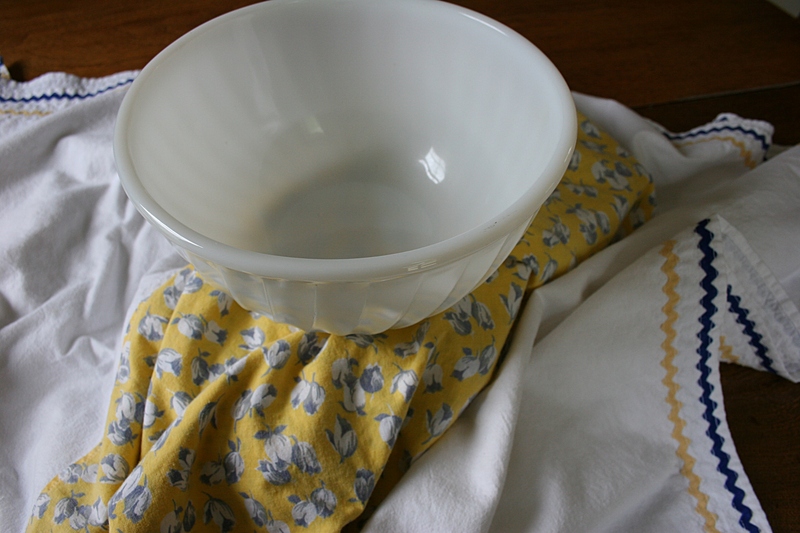 From another vendor I bought this Fire King bowl and handstitched tablecloth trimmed with rick-rack. Total cost: $5. Last week his sister, a Spanish medical interpreter in northeastern Wisconsin, shopped a half-price sale at an Appleton thrift store and purchased an easy chair for $24. A mint condition coffee table found next to a dumpster at her apartment complex cost her nothing. The oldest daughter, who lives in Minneapolis, also sometimes shops at second-hand stores and even bought her bridal gown for her upcoming wedding at a vintage bridal shop. Yes, I’m proud of my kids and their thrifty buying habits. Not only do they save money, but they recycle what others have cast off or can no longer use. 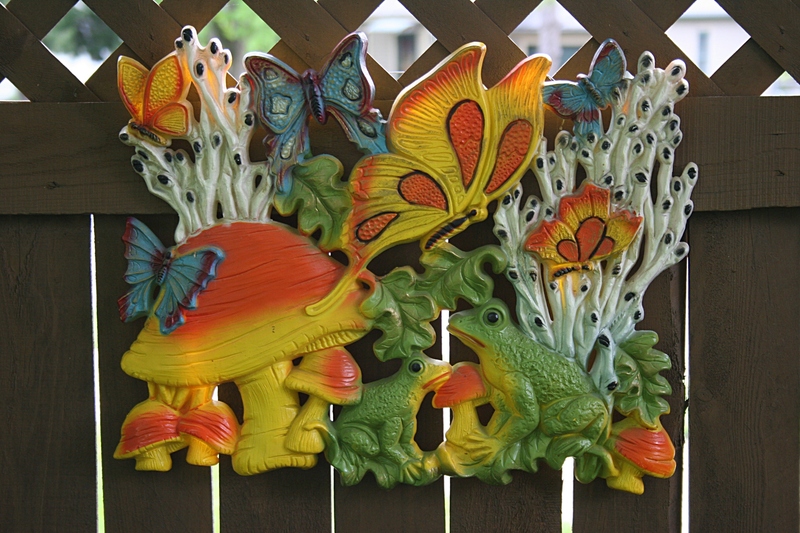 This kitschy art is so ugly it’s cute, if that makes sense. For 75 cents, it was mine. 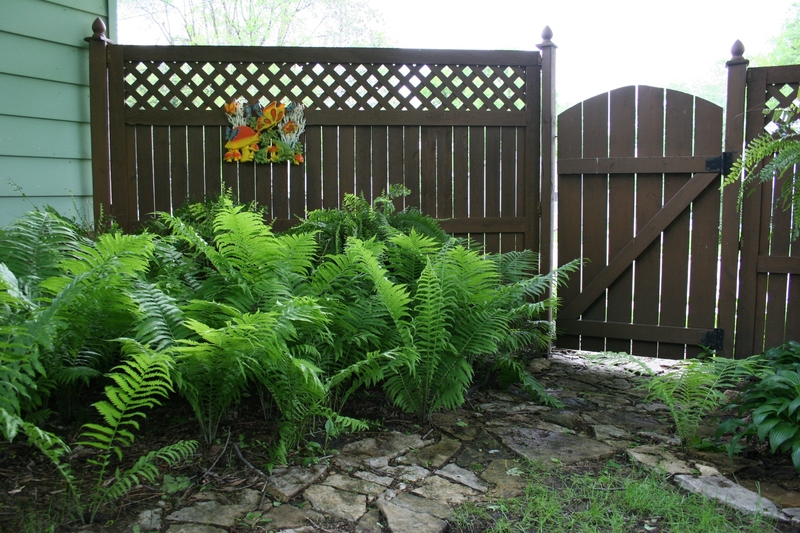 My husband just shook his head, but then hung it on our backyard fence anyway, per my request. My own house is furnished with lots of second-hand furniture, lamps, art, kitchenware, etc. I don’t need new. Old works for me, my tastes and my budget. How about you? I had the perfect spot in mind when I bought that frog art. 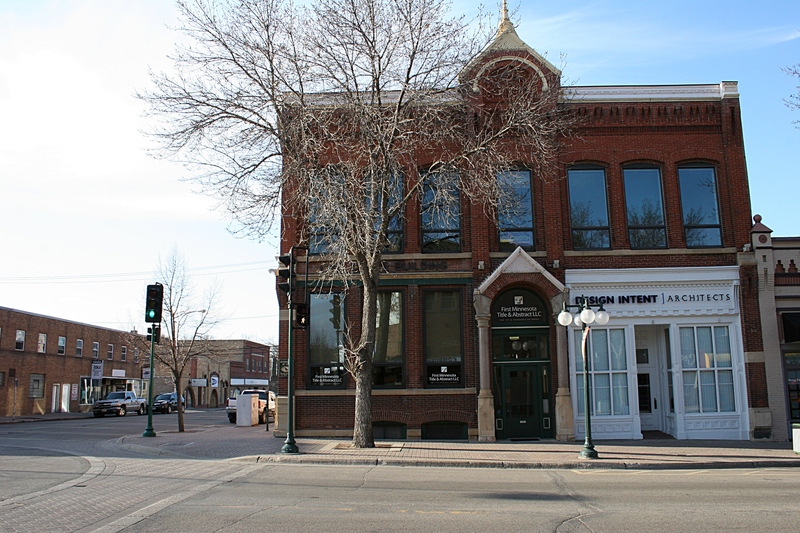 A snippet of Fergus Falls’ historic and pedestrian friendly downtown. 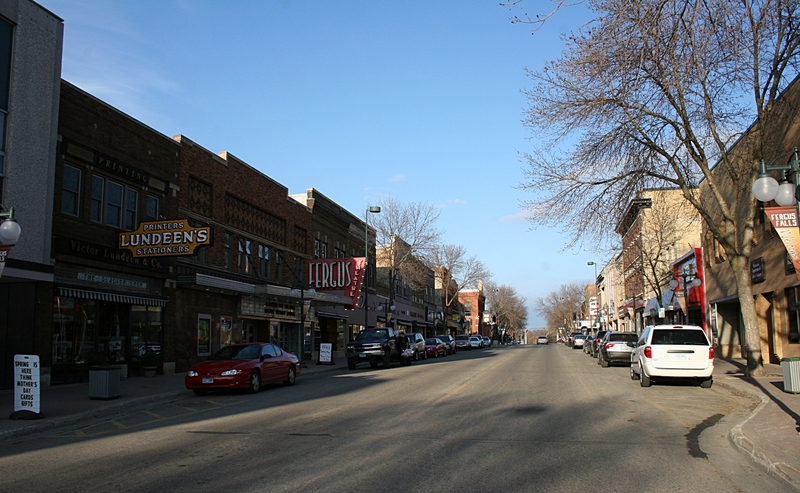 I SINCERELY HOPE the fine people of Fergus Falls in west central Minnesota appreciate their historic downtown. It’s a gem. 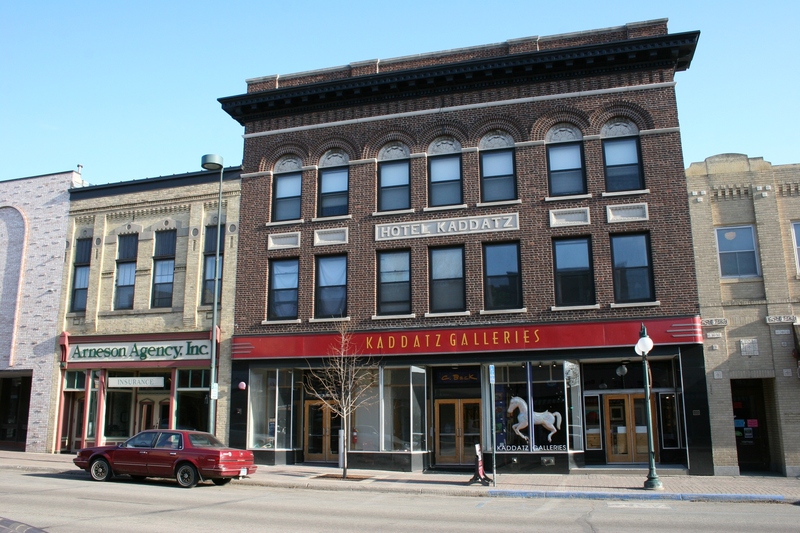 A stroll through the downtown business district on a recent Thursday evening left me gaping at the detailed architecture, words imprinted in granite, sculpted eagles and sculpted otters, stately brick buildings, a lovely old theatre, quaint signage and art, yes, art. This Otter Tail riverside community of nearly 14,000 along Interstate 94 an hour southeast of Fargo impresses me. Join me on a photographic tour and I expect you will feel likewise. 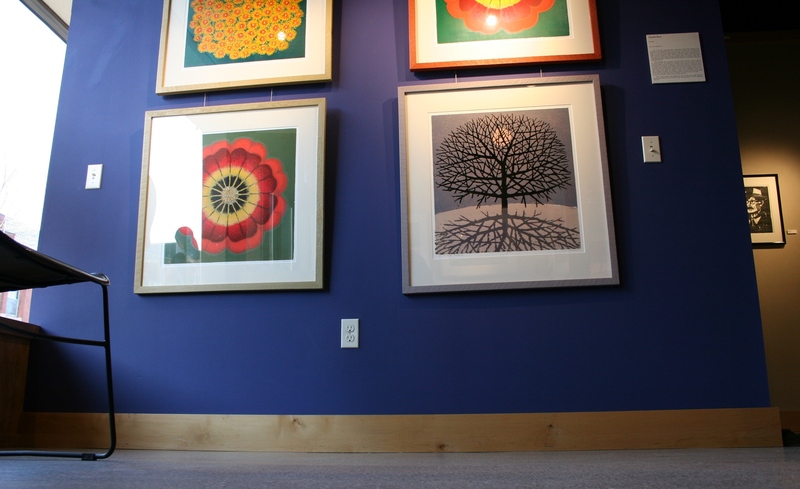 Kaddatz Galleries features, among other art, the work of noted Fergus Falls artist Charles Beck, known for his woodcut prints. Examples of Charles Beck’s woodcut prints in the Kaddatz Galleries. 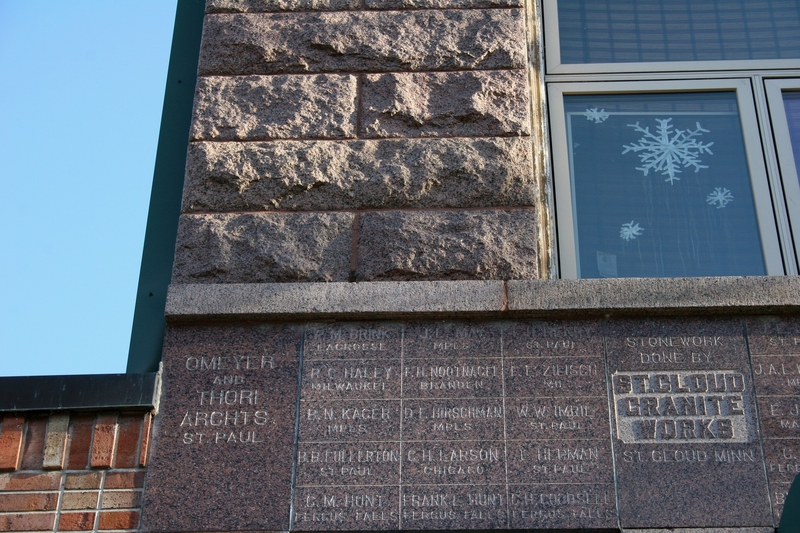 Words chiseled in granite…I would love to know the story behind this. 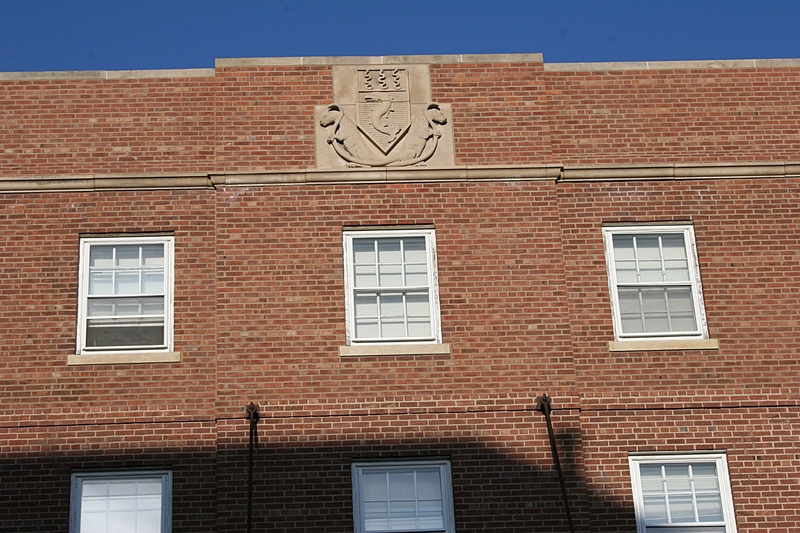 The inscriptions cover the bottom front of the building. 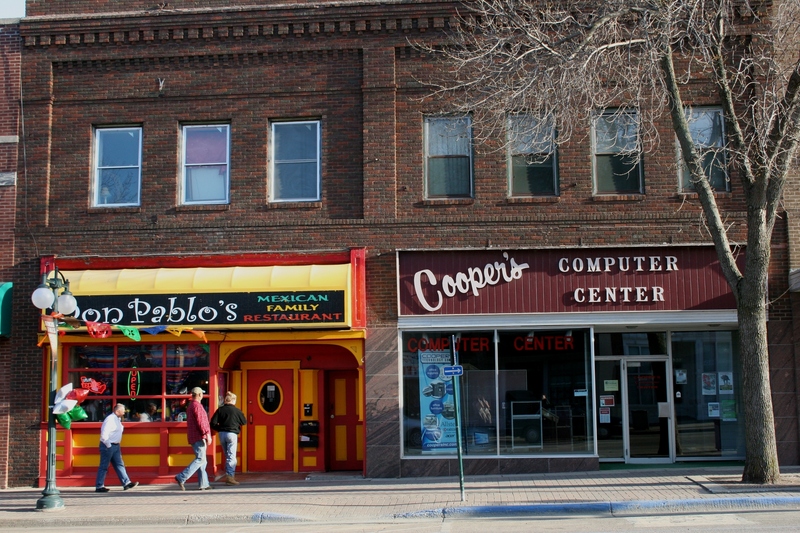 A Mexican restaurant adds a jolt of color to the downtown. 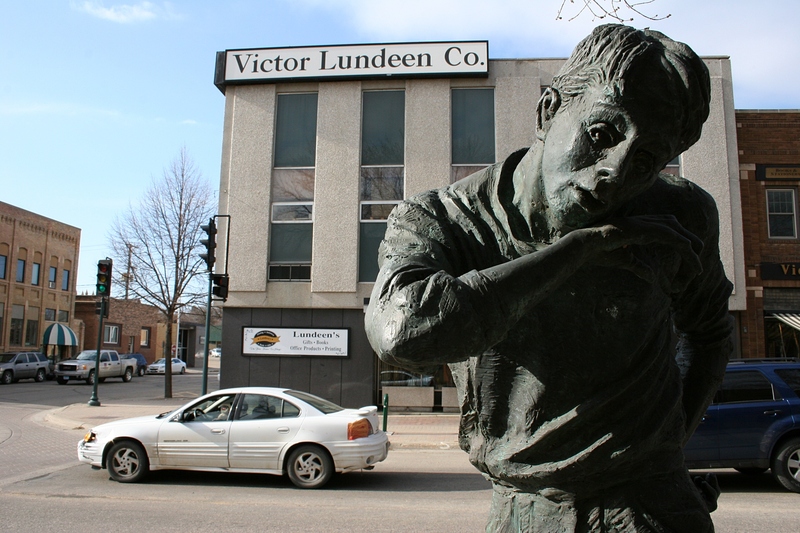 When I inquired at Kaddatz Galleries about the identity of this street corner statue, I didn’t get an answer. The gracious gallery tender says plans are in place to identify public art. Good idea. 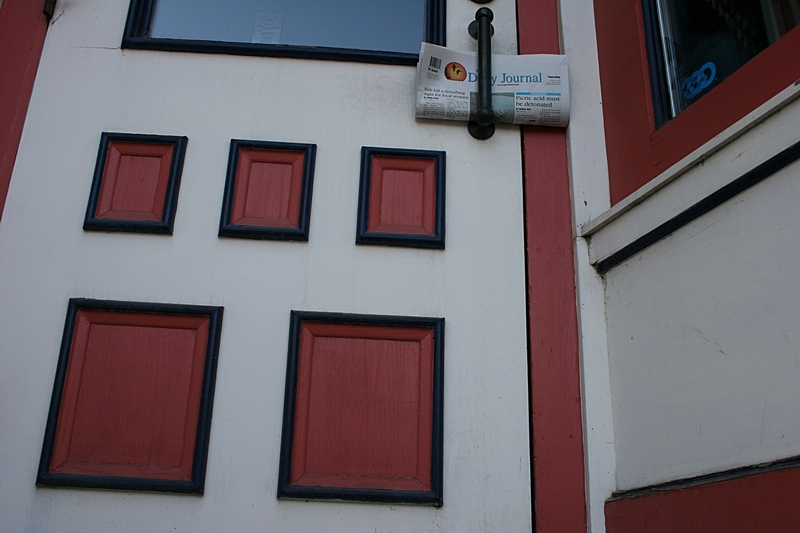 I spotted The Fergus Falls Daily Journal tucked into a door handle downtown. I stared for a while at this sculpture atop the historic River Inn before realizing these are otters. The inn sits along the Otter Tail River. I believe this building today houses only apartments and does not operate as an inn. 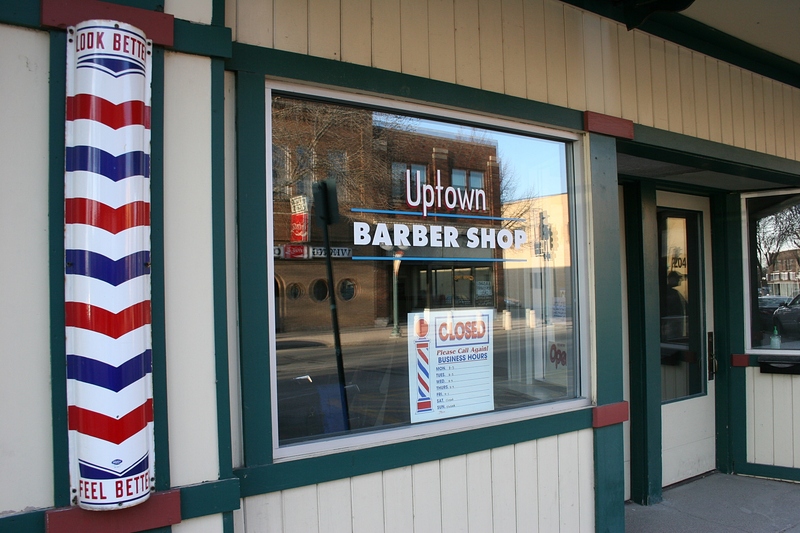 The Uptown Barber Shop, complete with a barber’s pole, charms visitors like me. 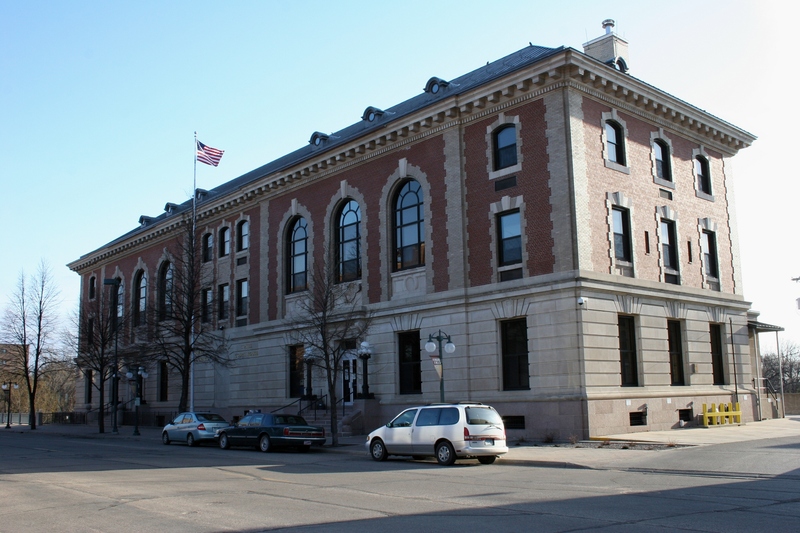 This hulking federal building houses courtrooms and the post office. 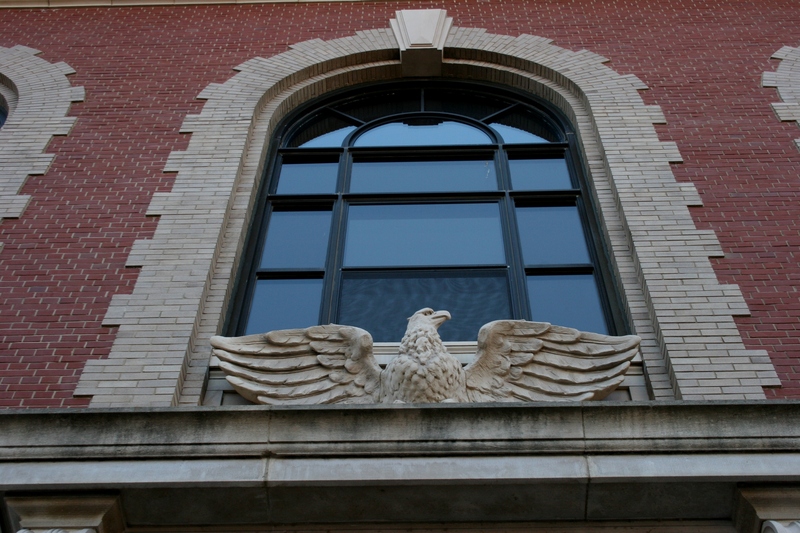 Stunning eagle sculptures span the front entries into the federal building. 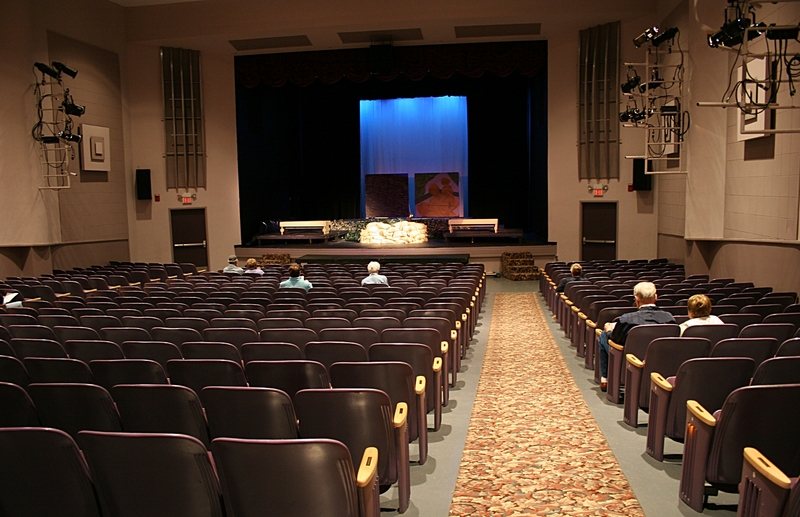 Audience members filter into an historic theatre for a play presented at A Center for the Arts. 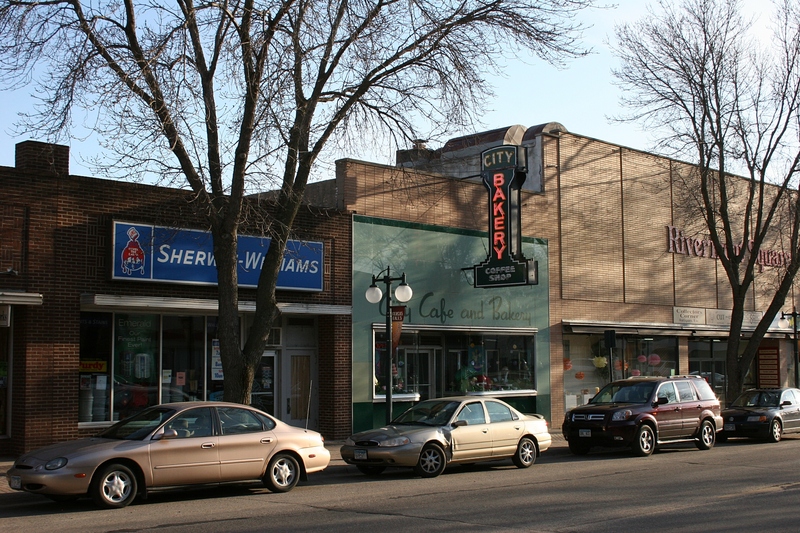 Just another shot of businesses in downtown Fergus Falls. 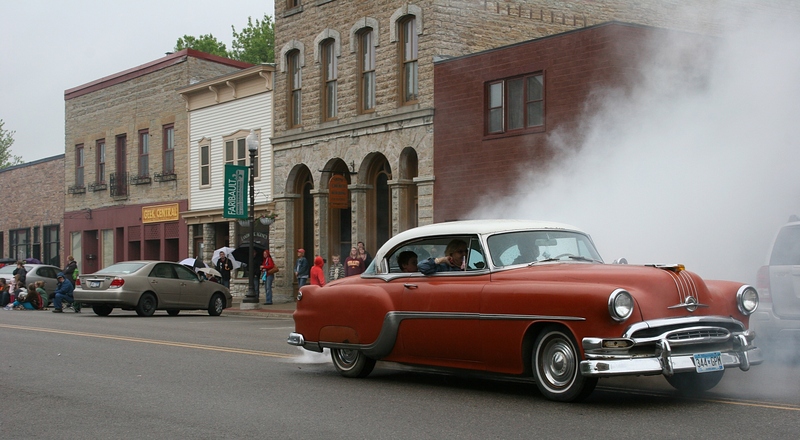 FYI: To view previous posts from Fergus Falls, use my blog search engine to check my archives. 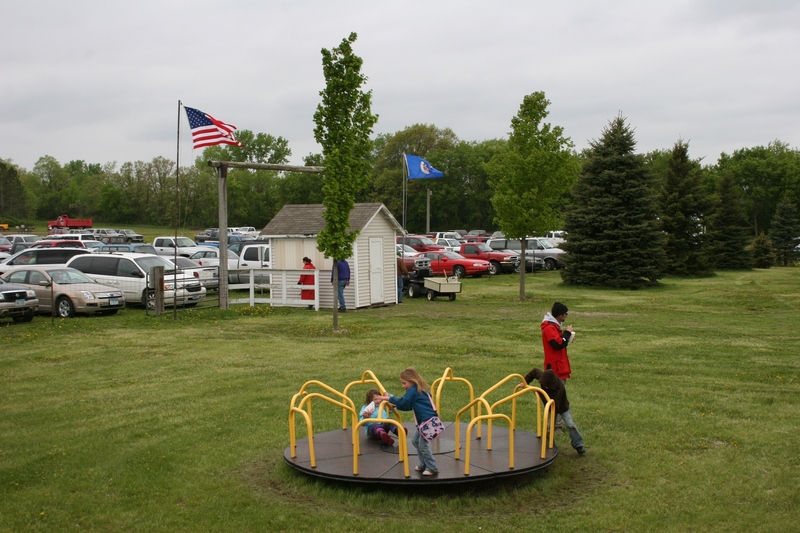 I posted last week and during the week of June 12-18, 2011, on my first visit to Fergus Falls. Also, watch for more posts from this community. 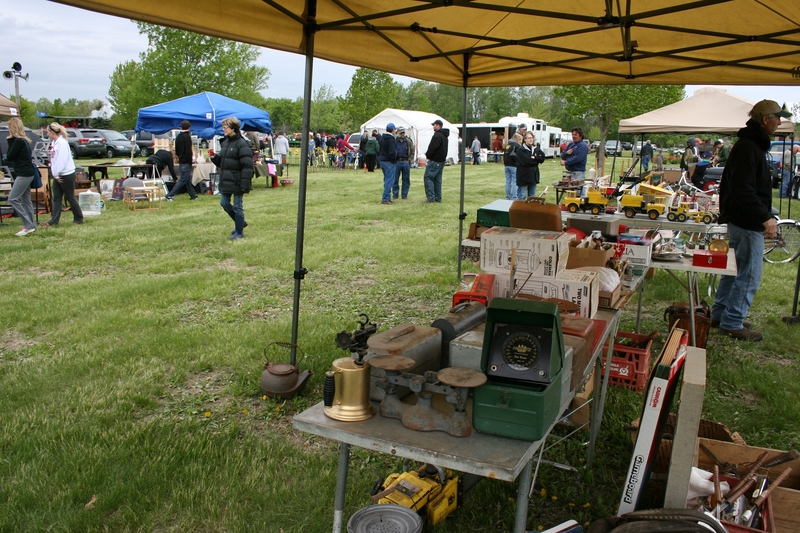 An overview of the Rice County Steam & Gas Engine Flea Market Saturday morning near Dundas. FLEA MARKETS OFFER an eclectic mix of merchandise and people, the two ingredients which make shopping and photographing these venues especially entertaining and enlightening. Mr. Socko, the sock guy, right, vends socks from Fox River Mills, which originated in Appleton, Wisconsin (home to the Fox River), before moving to Iowa. 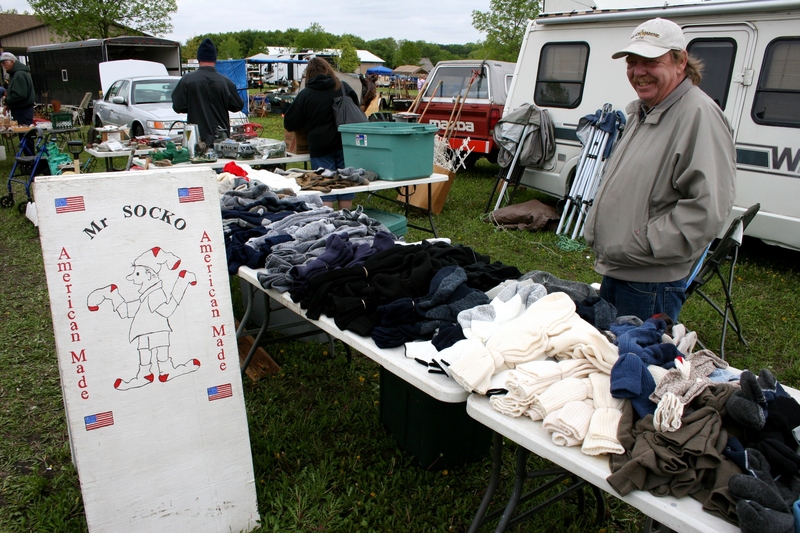 For example, I met Mr. Socko of St. Paul peddling American made socks this past weekend at the Rice County Steam & Gas Engines Flea Market in rural Dundas. Ben Suckow’s (his real name) been selling socks for seven years, driving down to Fox River Mills in Osage, Iowa, to pick up these quality socks to vend at flea markets. Pigs crafts by Gerald Skluzacek. 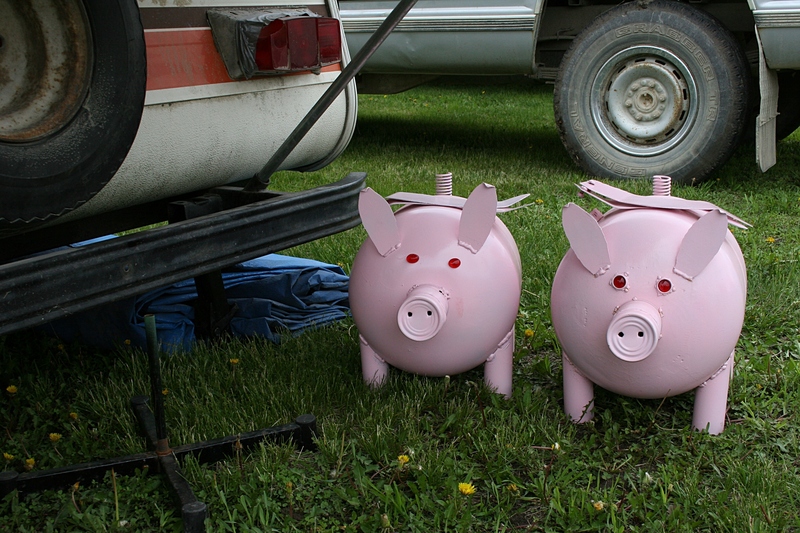 At the same event, I spotted whimsical flying pigs (and other) garden art created by Northfielder Gerald Skluzacek, retired owner of a sandblasting company. He also makes jewelry. 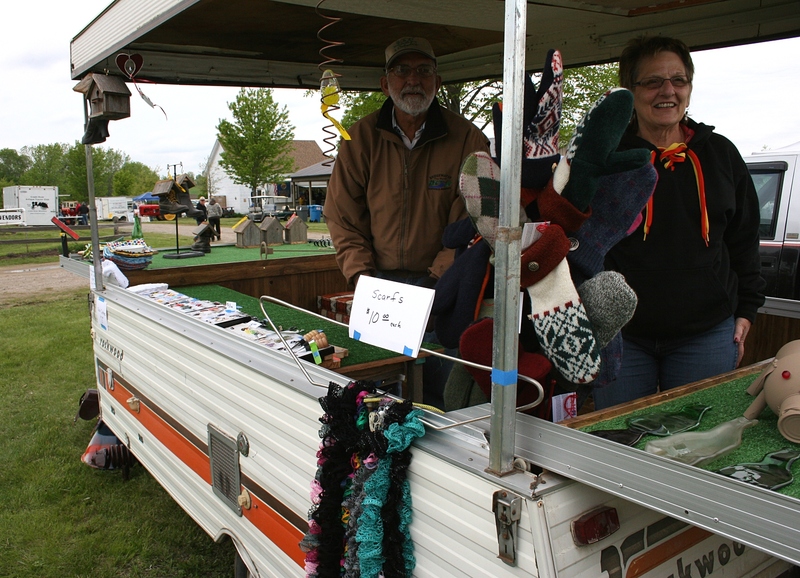 Linda Stadler arrived with her mittens to sell in Gerald Skluzacek’s vendor trailer. On this cold Saturday, his and wife Jane’s friend, Linda Stadler, arrives with mittens she crafted from recycled sweaters. And, yes, the weather was cold enough to warrant mittens. Linda would be minding the Garden Space while Gerald attended a party. As a bonus, Linda asked if I was “that blogger,” yes, the one who writes about her ventures into small towns. That would be me. Always nice to meet a reader who appreciates your blogging. Photogenic and personable Albert Remme. 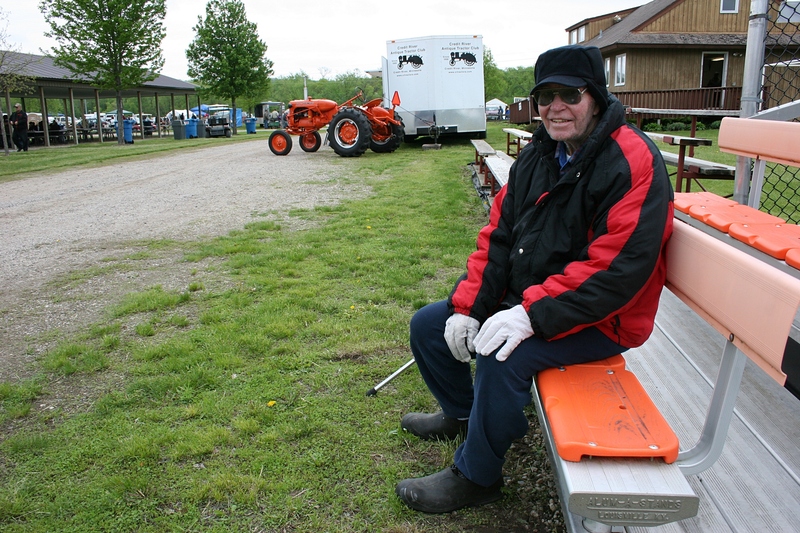 I also had the honor of meeting and chatting with Albert Remme of Dennison, who was bundled in a warm coat, an ear flapper cap and gloves on this windy 50-something degree day as he waited on bleachers for his nephew. After seeking permission to photograph him, I asked Albert if he was a retired farmer. He was a farmer and a soldier. Drafted between Korea and Vietnam, Albert was sent to Hawaii and thanks God he never saw combat. “I don’t know how you could kill anyone who’s done nothing to you,” he said. Then I told him about my dad, a Korean War vet who fought on the front lines. “It was kill or be killed,” I shared. Not easy. And Albert just kind of nodded his head in silent agreement. And that’s how these photo shoots go—I spot an interesting person or object or scene and I either shoot a few quick frames or I shoot, then pause to learn more. Every time I attend this flea market, I look for a weird piece of merchandise. This year it would be these horns. Why, I ask, would anyone save these? 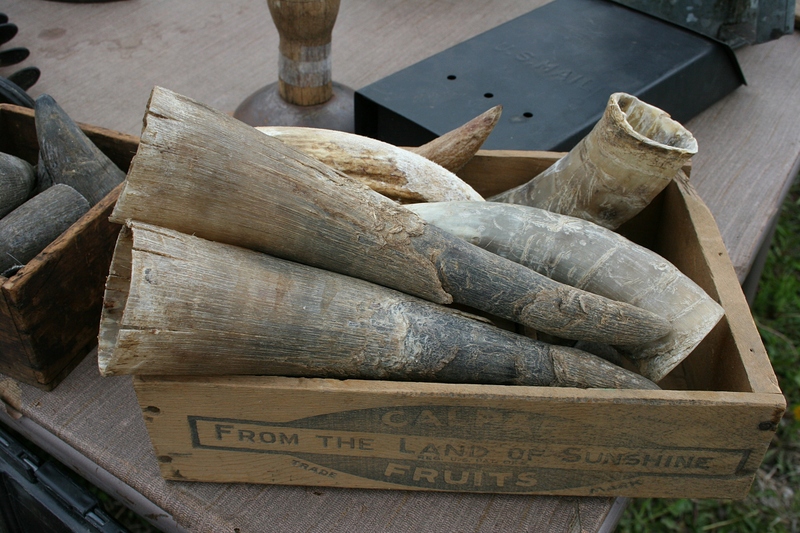 Would you buy these horns or try to sell them? 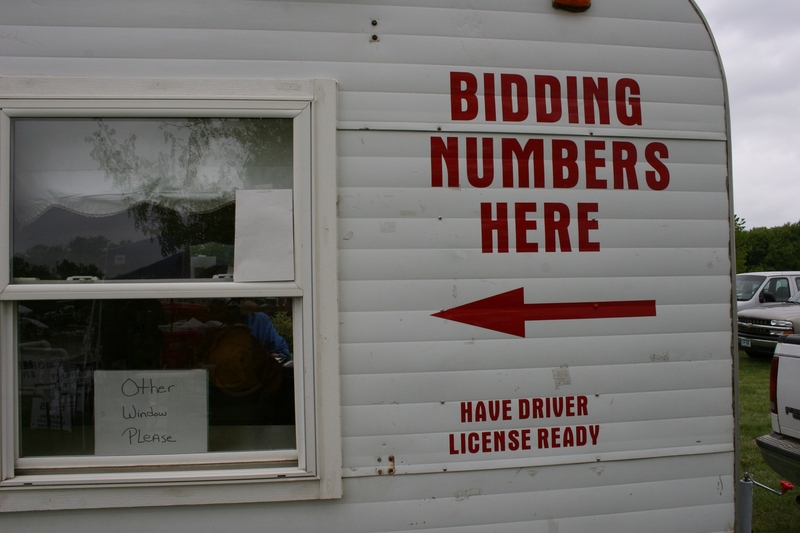 Signs tell a story, too, like this on an auction wagon there for the live auction. 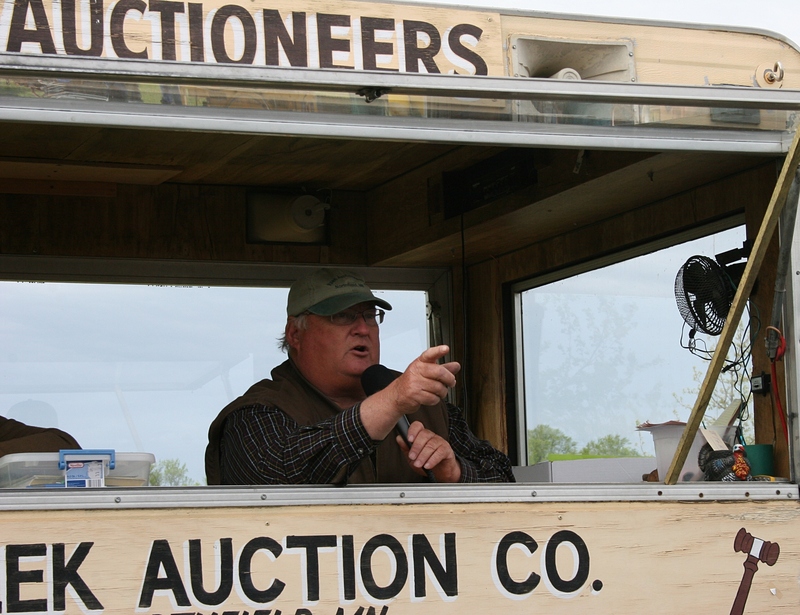 The auctioneer solicits bids from his movable auction wagon. 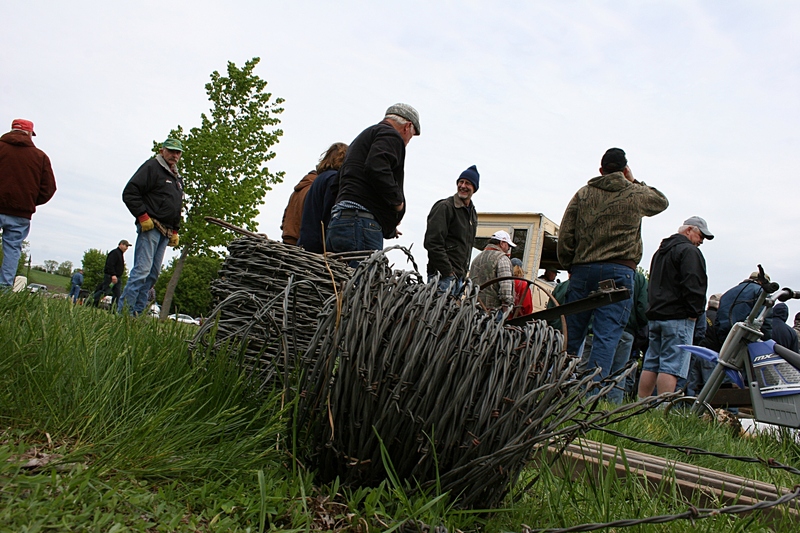 I set my camera on the grass to shoot this image of barbed wire that had been auctioned off as the auction continues. 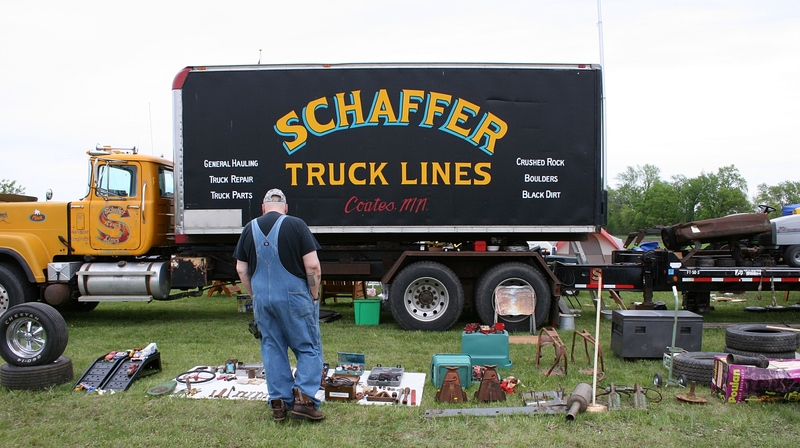 FYI: Click here and here to read two previous posts from the Rice County Steam & Gas Engines Flea Market. Check back for one final post in which I will show you my purchases. EACH MAY HE GIFTS me with the intoxicating scent of spring. 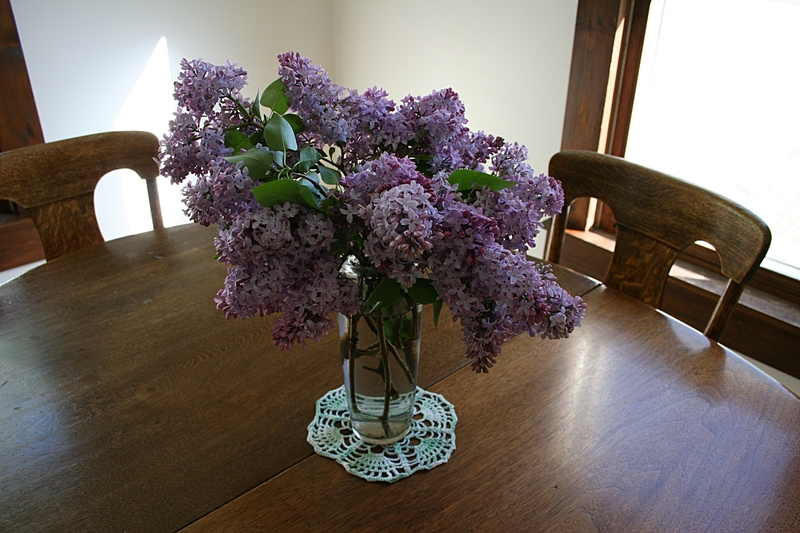 A bouquet of lilacs, gathered from a bush in the park up the hill. Typically my husband stops on his way home from work, pulls a jacknife from the pocket of his greasy work pants, sometimes stands on the tips of his Red Wing work shoes to saw tough, determined stems clinging to a gnarly bush. 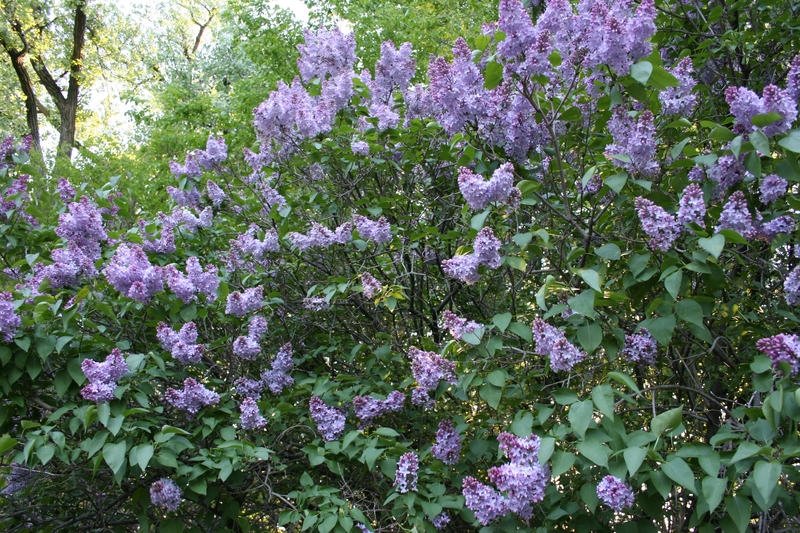 But this year, on the eve he drove down the gravel road into the park, he found the lilacs still tight-closed, not yet ready to unfurl in the chill of a late spring. 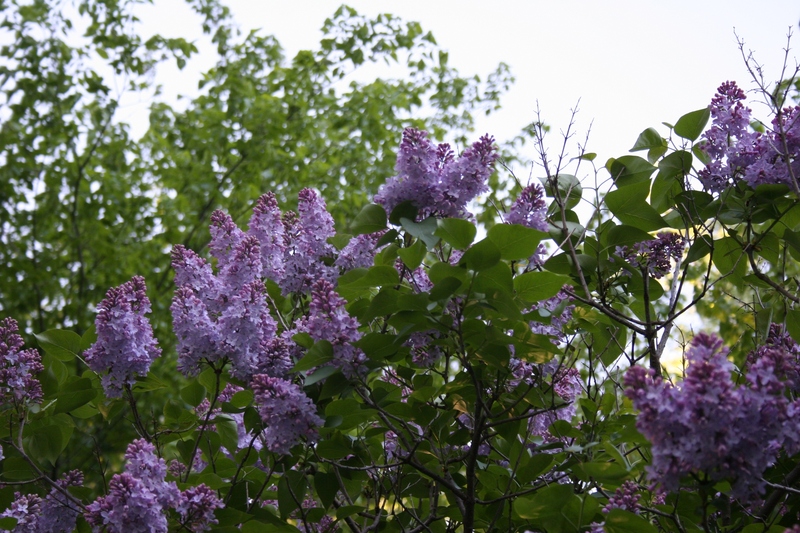 A few days later, en route home from dinner out, I noticed lilacs in full bloom. Instead of turning into our driveway, Randy aimed uphill toward the park, entering past a group of teens playing Frisbee golf. 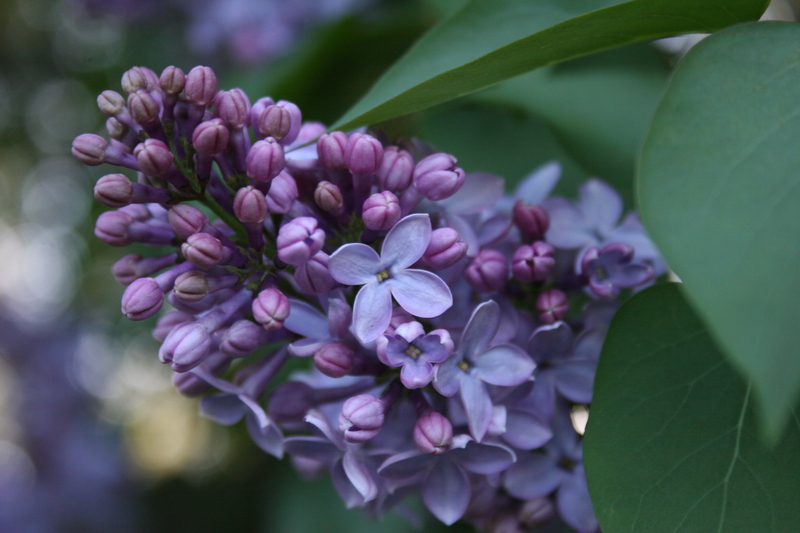 I can only imagine their chatter as they witnessed us, in our white mini van, parked beside the lilac bush, Randy cutting lilac stems, me shooting photos. 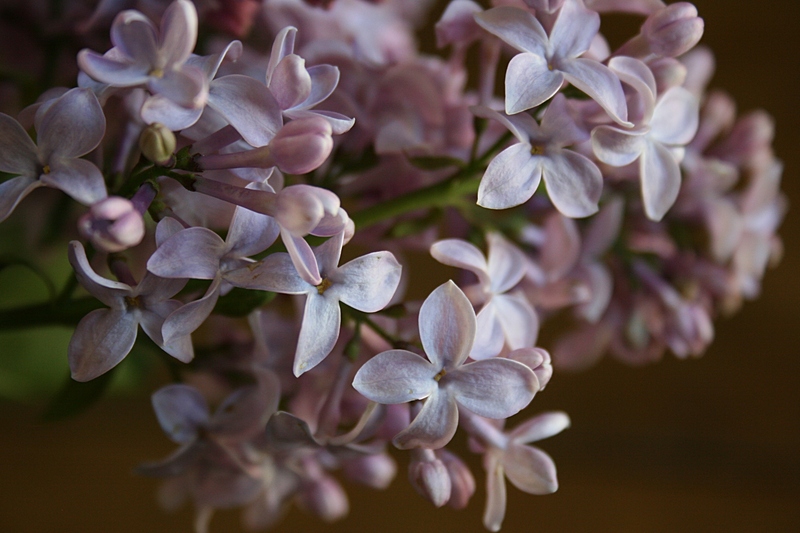 They do not understand yet—what it means to see your hardworking husband walk through the door each May with an armful of lilacs, the spring blooms filling your home with the heady scent of love. 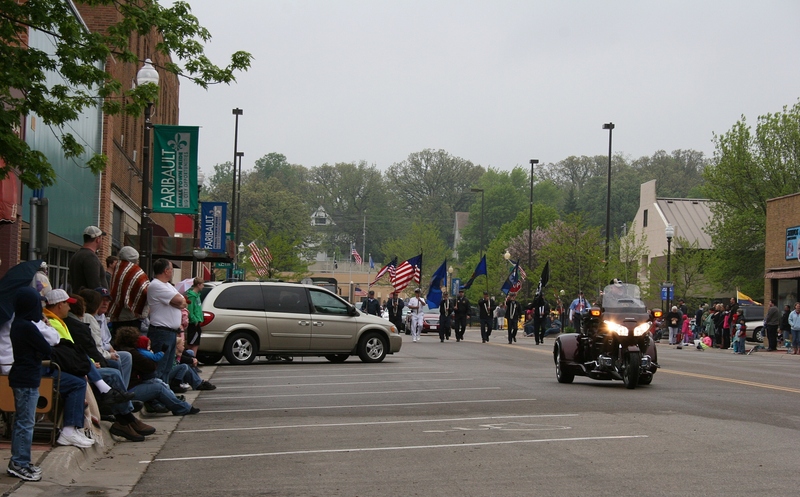 The annual Memorial Day parade, which I’ve attended for decades, begins along Central Avenue in Faribault. 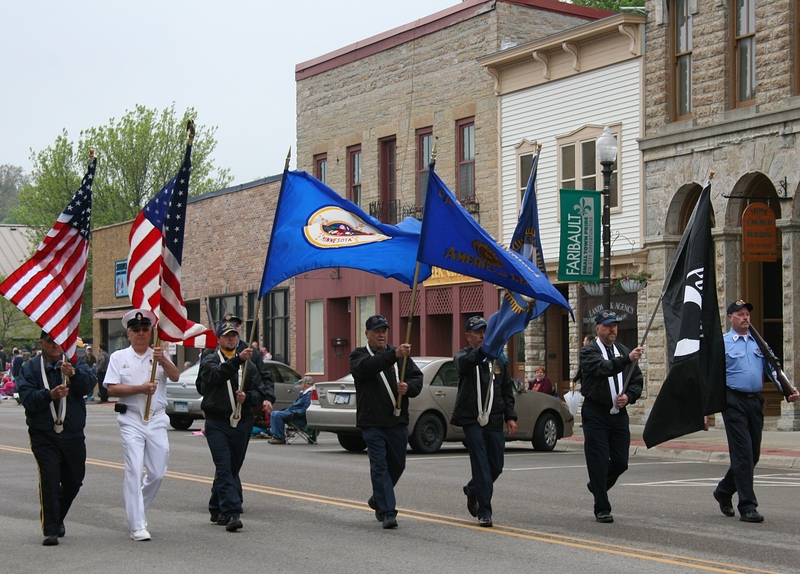 UNDER OVERCAST SKIES sometimes spitting drizzle, and in 54-degree temps, folks gathered along Central Avenue in historic downtown Faribault this morning to honor veterans. Perched under an umbrella held by my husband, Randy, I photographed the annual Memorial Day parade from my curbside lawn chair, wiping the occasional drops of rain from my camera lens. The Color Guard leads the parade. 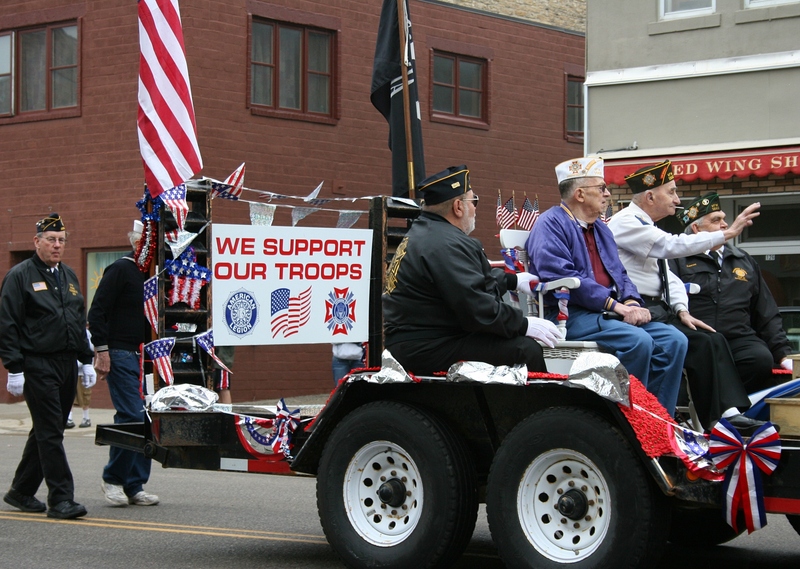 Veterans ride in the parade. As I focused on the marching veterans and musicians, the kids scrambling for candy, the American flags and more, I considered that my uncomfortableness in the morning chill was nothing, nothing at all, compared to what many of these vets endured. I thought of my dad, dead 10 years now, and his stories of the bone-chilling cold he felt while fighting on the front lines during the Korean Conflict. 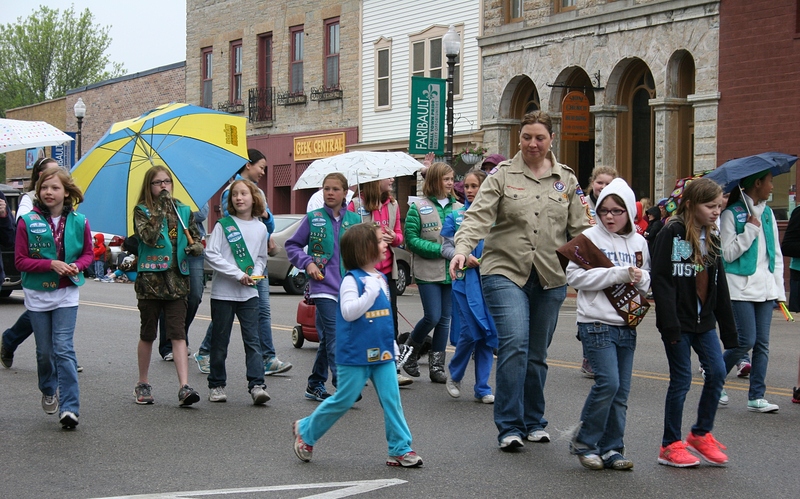 Girl Scouts walk in the rain at the end of the parade. 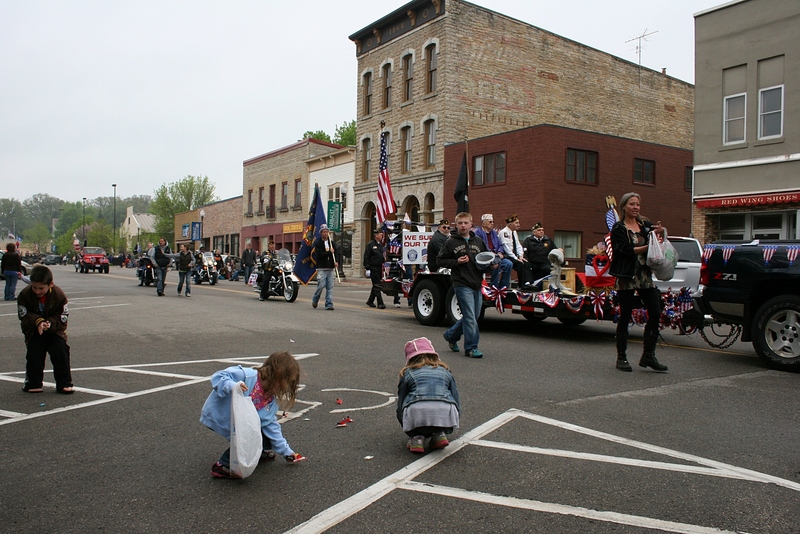 And then, after the parade, when I skipped the Memorial Day Program at Faribault’s Central Park because the drizzle had turned to steady rain, I questioned that decision. Why couldn’t I sit for 30 minutes in the cold and rain and listen to these veterans? When Randy (who had gone to the park) texted that I could hear the program on the local radio station, I tuned in to KDHL and listened to honored combat veteran Jerry Anderson, who served in Vietnam. Anderson didn’t speak of his Vietnam experiences. Rather he reminisced about coming home from Vietnam to unappreciative and protesting Americans and the shame he and other vets felt. Faribault native and Honorary Grand Marshal Bob Sommers and his wife, Raquel. 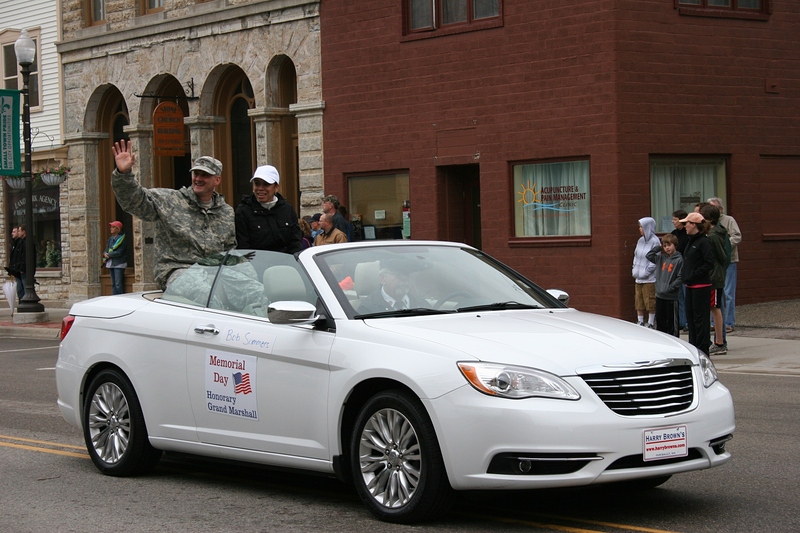 Then, just as my friend, Bob Sommers, honorary grand marshal who served two tours of duty in Iraq, was about to speak, the radio station’s line to the Memorial Day Program cut out. 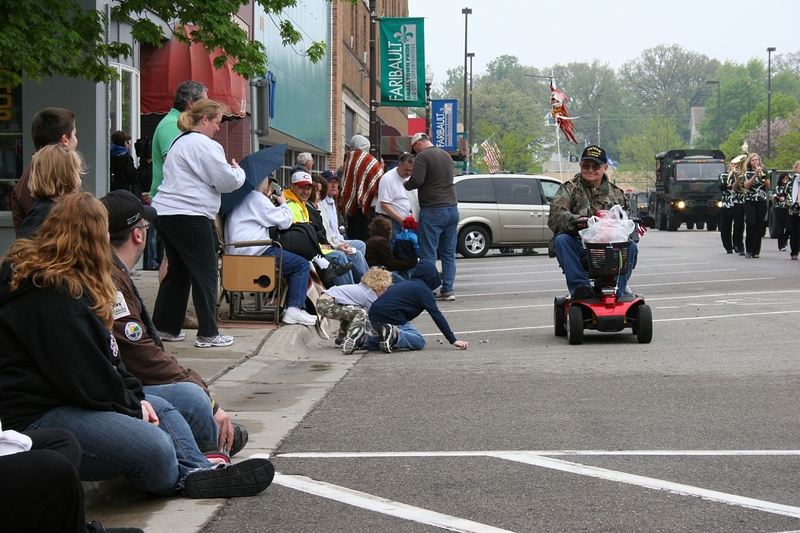 A vet on a motorized scooter tosses candy to the kids. So I returned to my computer, to selecting and editing photos and writing these words, asking you, today, to please remember those who have served, and to thank them. 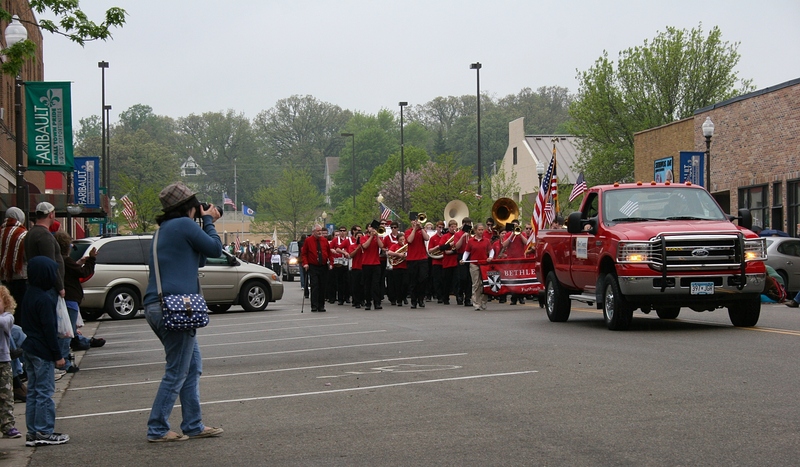 Bands from Bethlehem Academy, shown here, and Faribault High School performed. This vintage car exited the parade route after about two blocks. My husband automotive machinist diagnosed a blown head gasket. 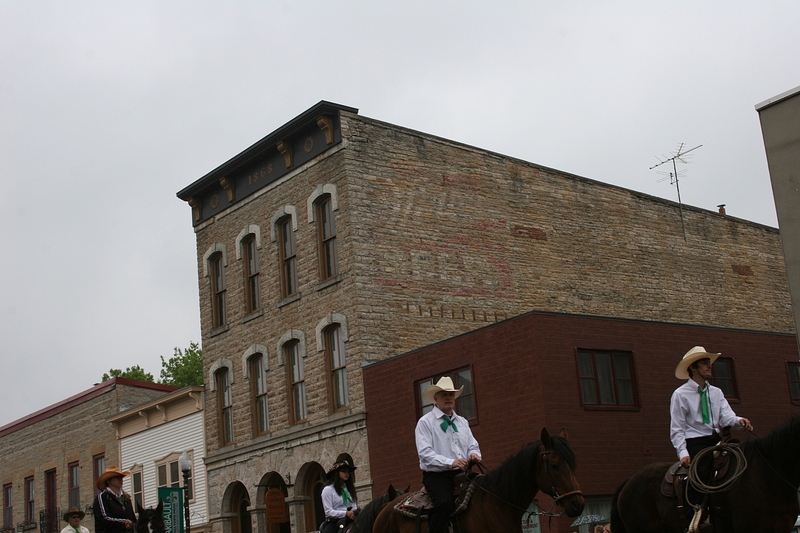 Horses on parade through our historic downtown. 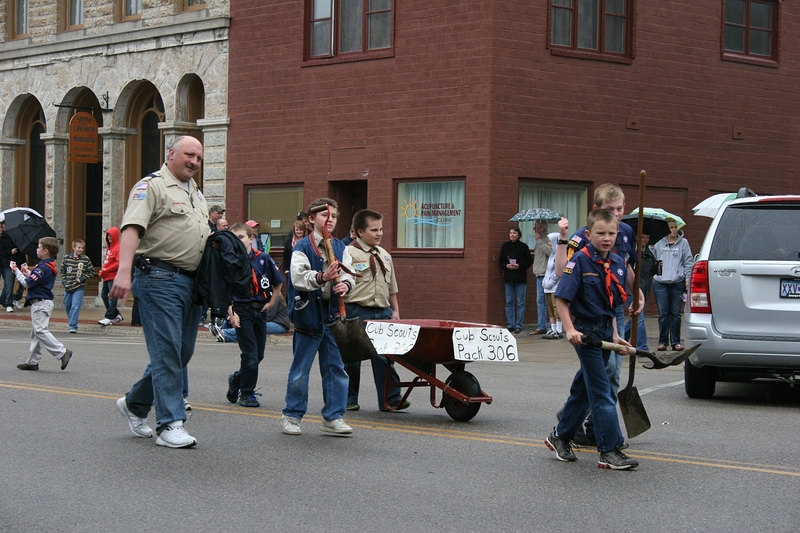 The Cub Scouts always follow to scoop up the horse poop. AFTER SHOOTING 101 PHOTOS in about two hours on Saturday at the Rice County Steam & Gas Engines Flea Market, I was trying to determine how to showcase the best shots here. CAP CLAD CHILDREN and Dad CLASP hands. I just love this photo. And, yes, the weather was COLD with temps in the 50s and a WINDCHILL. 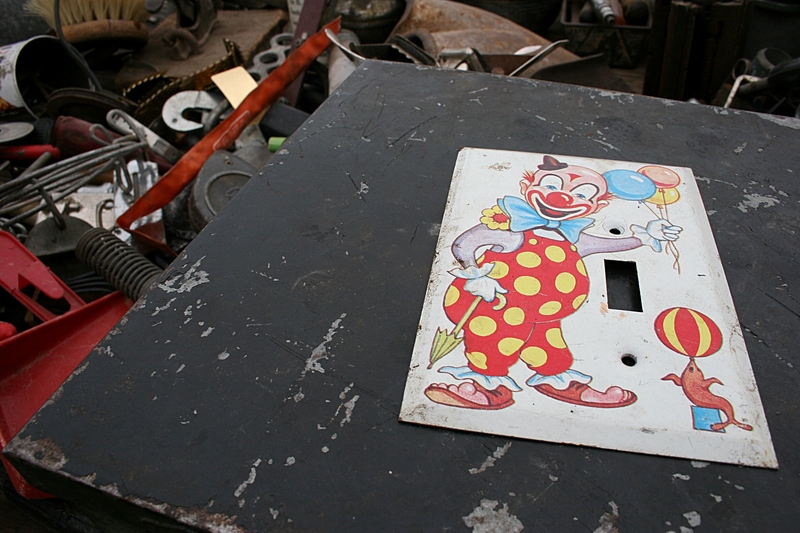 Among all the tools and miscellaneous junk, I spotted this CLOWN light plate switch COVER. Makes me wish I had a kid’s room to decorate. Sam from COATES, snugged in his COAT, reads CARTOONS in the back of his dad’s flea market truck. The 10-year-old COLLECTS knives and lighters. 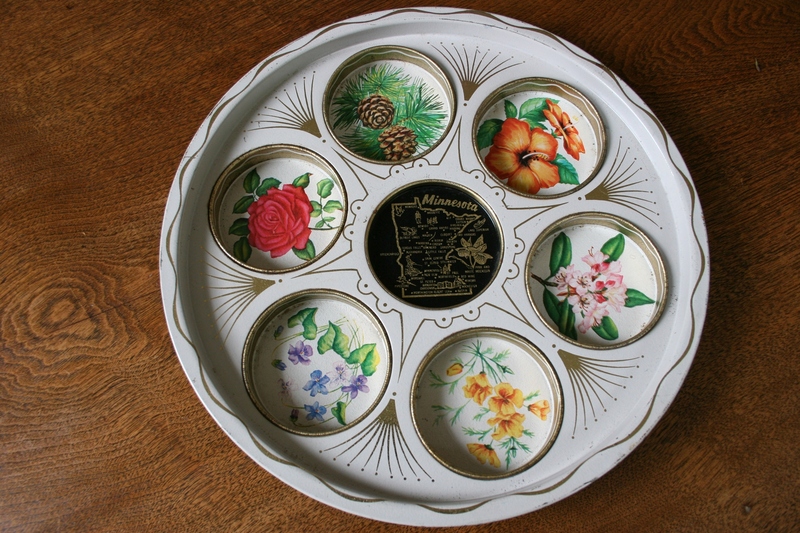 Lovely CAKE CARRIERS and COLORFUL CUPS for the COLLECTOR. Don’t be fooled into thinking this is an actual ear of CORN. It is not. 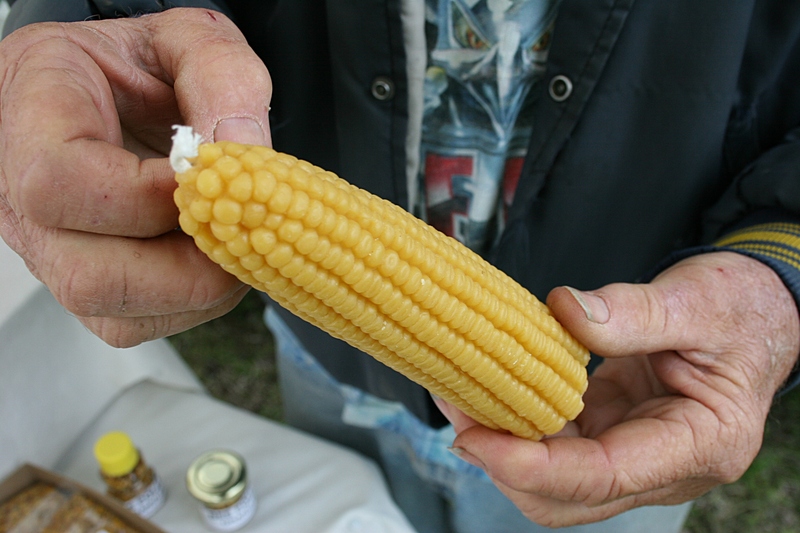 This is a CORN CANDLE CRAFTED from beexwax by Bob Draheim of Busy Bee Honey Farm, CANNON Falls. He made a mold from a real ear of CORN. How COOL is that? I suppose when you purchase CHAINS, the easiest way to CART them around, if you don’t buy the yellow CART in the background or don’t own the red CHEVY Suburban, would be to toss the links across your back and shoulders. My husband, who works as an automotive machinist at the NAPA store in Northfield, COVETED this $30 NAPA CALENDAR gripped by the vendor after the wind tore it from her hands. 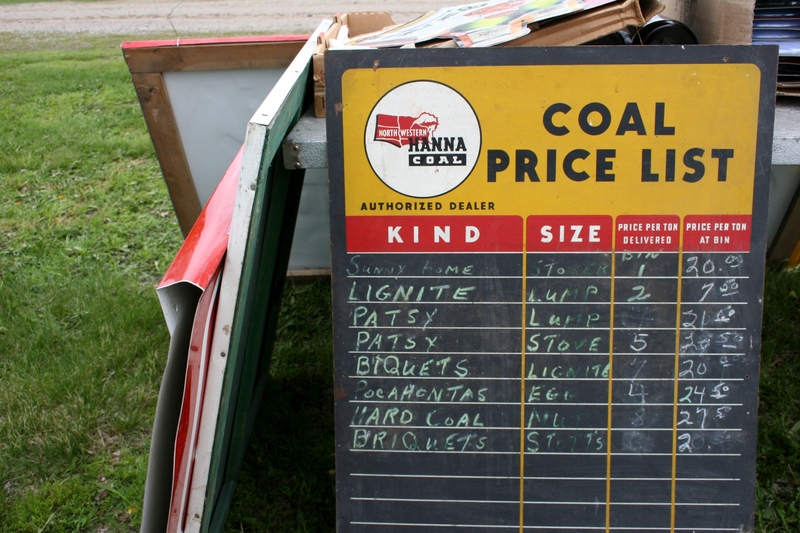 An unusual flea market find: a COAL price list. Who knew there were so many types of COAL? 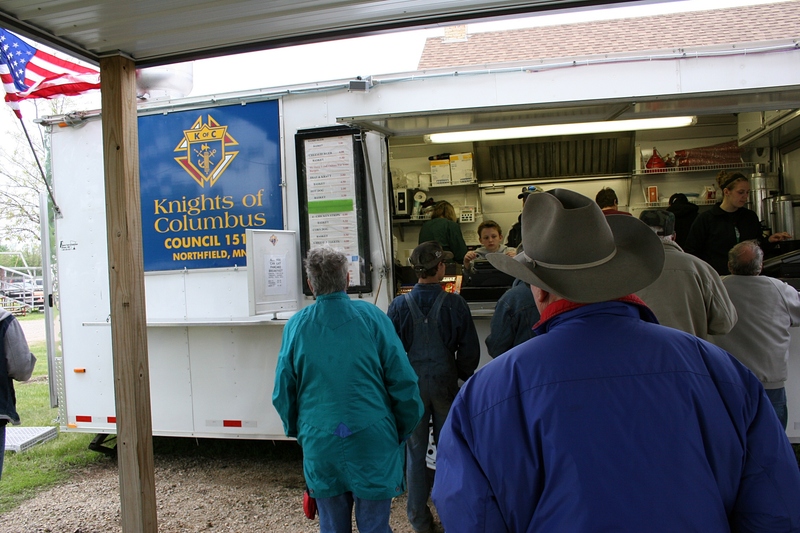 Hungry shoppers, including one in a COWBOY hat, line up for CHOW (aka burgers and brats) from the Northfield Knights of COLUMBUS food wagon. 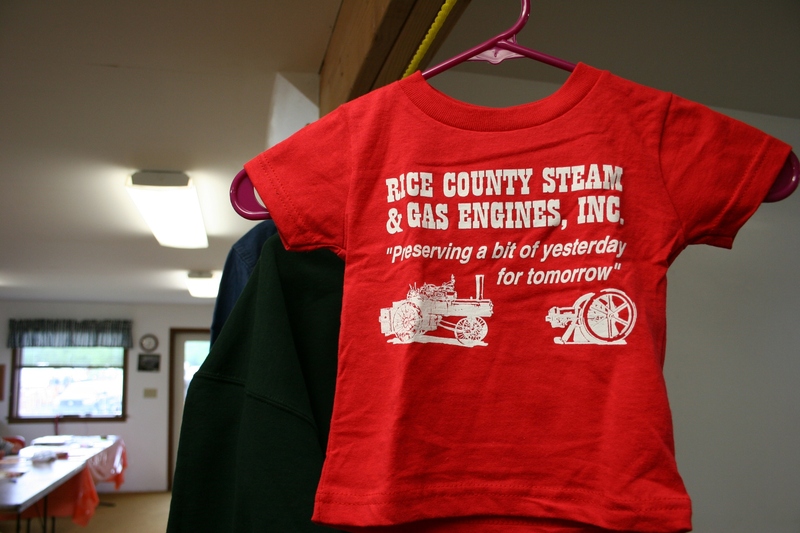 CLOTHING, including this t-shirt sporting the Rice County Steam & Gas Engines motto, were on sale in the CLUB’S office. 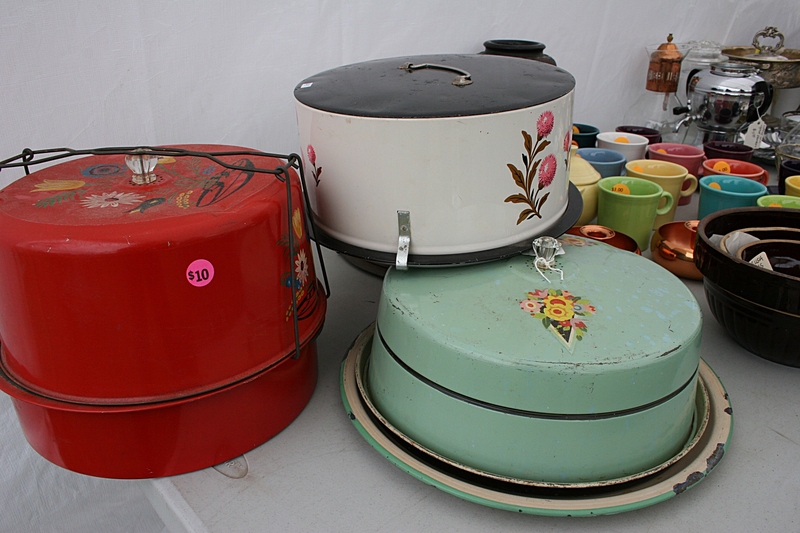 FYI: Click here to view a previous flea market post and check back for two more posts. One will feature my flea market purchases. 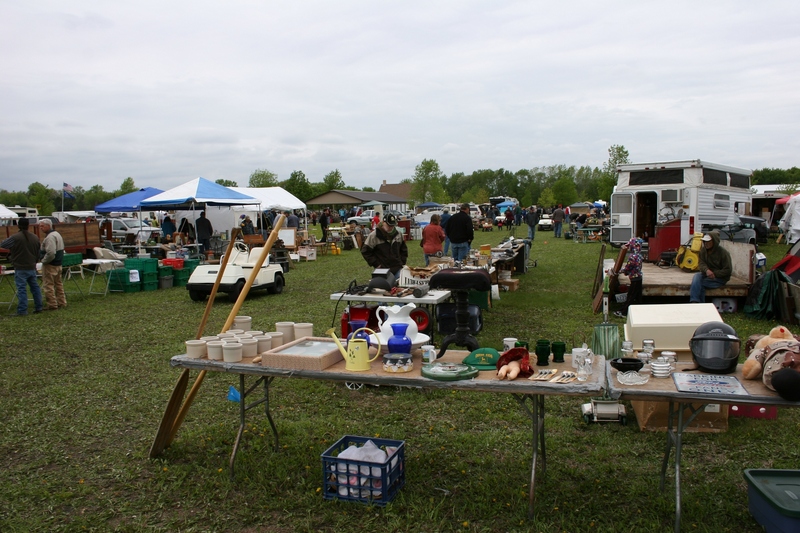 The flea market runs until 5 p.m. today. Maybe. Significant rain is falling in the area, perhaps enough to fold up the flea market. You may want to contact a club officer before traveling to this event today. 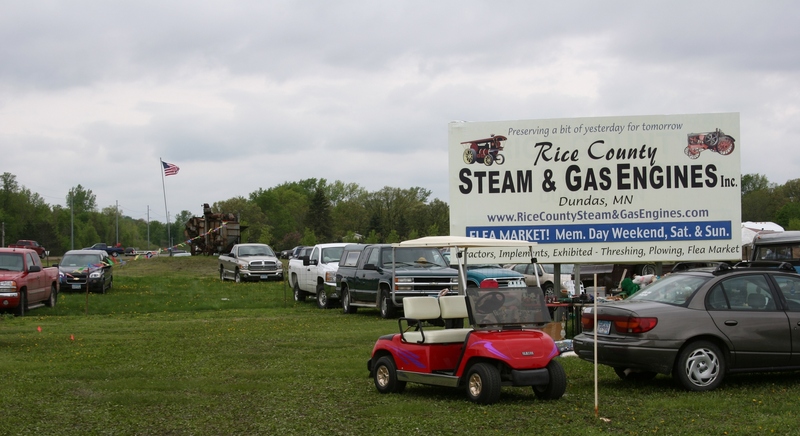 The Rice County Steam & Gas Engines Flea Market is located three miles south of Northfield along Minnesota Highway 3. 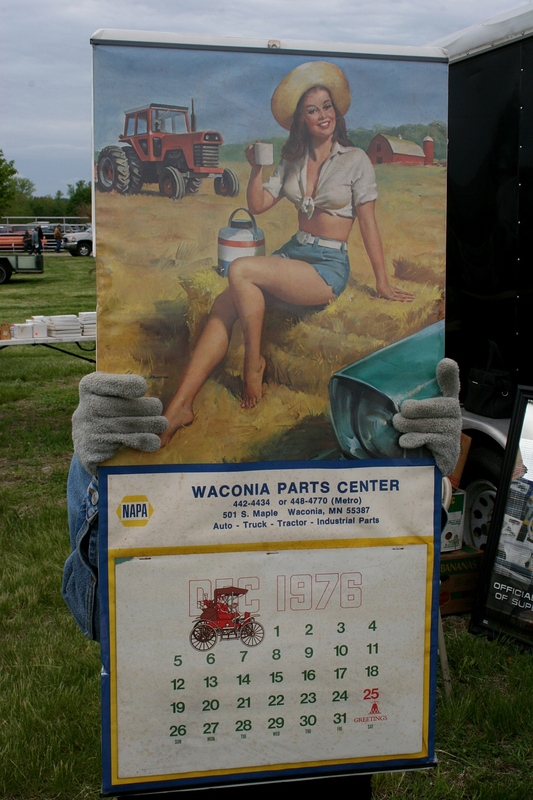 ON THIS BRISK SATURDAY in southeastern Minnesota—and I mean brisk as in ya better bundle up if you’re spending any time outdoors—my husband and I hit the Rice County Steam & Gas Engines annual Memorial Day weekend flea market. 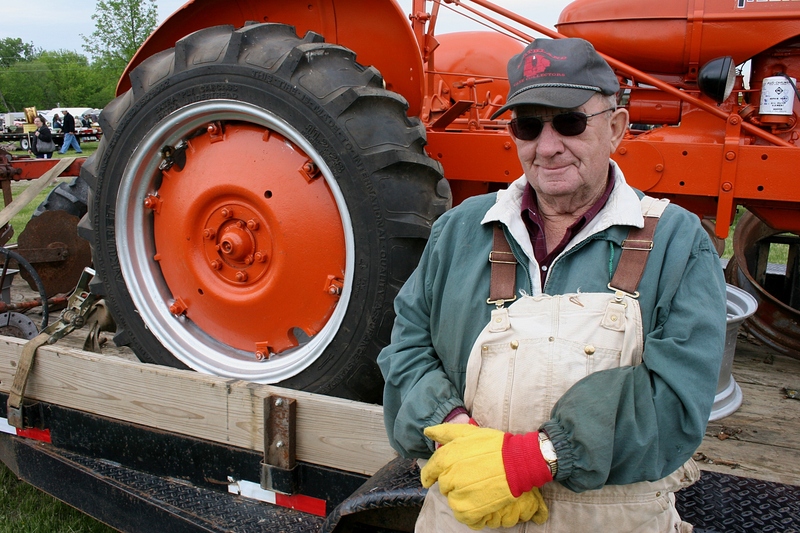 Don Atkins of Carver invited me to the Scott-Carver Threshers 50th Harvest Festival on August 2 – 4 in Jordan. I can’t decide what I enjoy more about this slice of rural Americana. The people watching. Or the shopping. Or photographing the flea market. 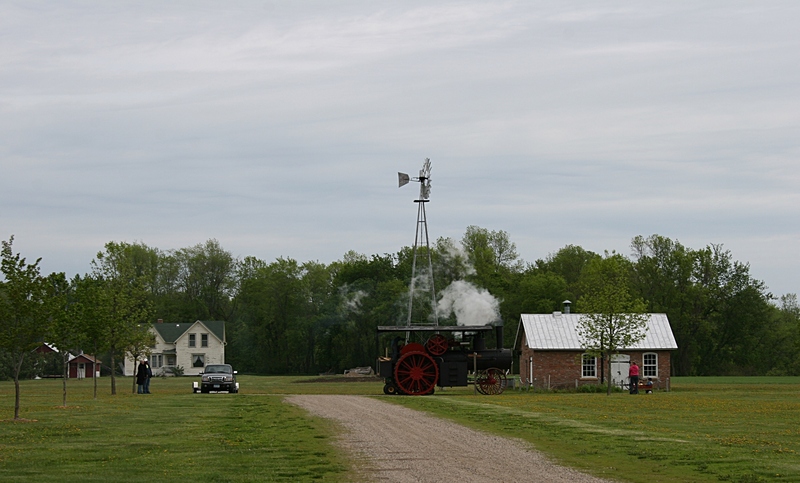 Even the old steam engine tractor was fired up for the day. Photo ops abound at this event located on acreage along Minnesota Highway 3 near Dundas (between Faribault and Northfield). Vendors galore at the flea market. Allow yourself several hours to poke around. 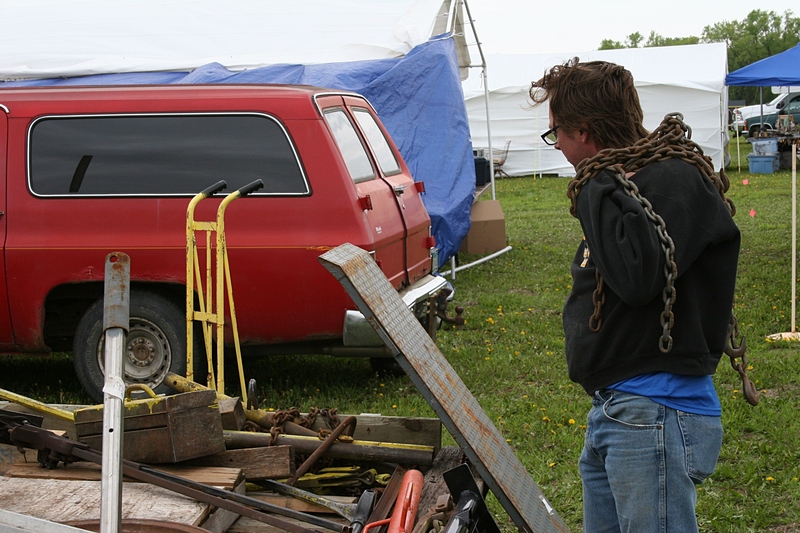 Despite the whipping wind, the tents, and most of the merchandise, stayed put while all ages perused what some might categorize as junk, others as treasures. 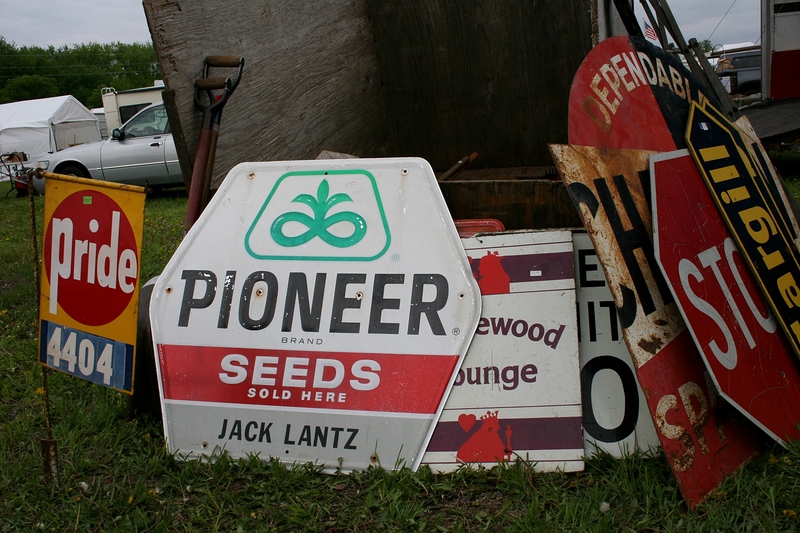 You’ll find lots of vintage signage. 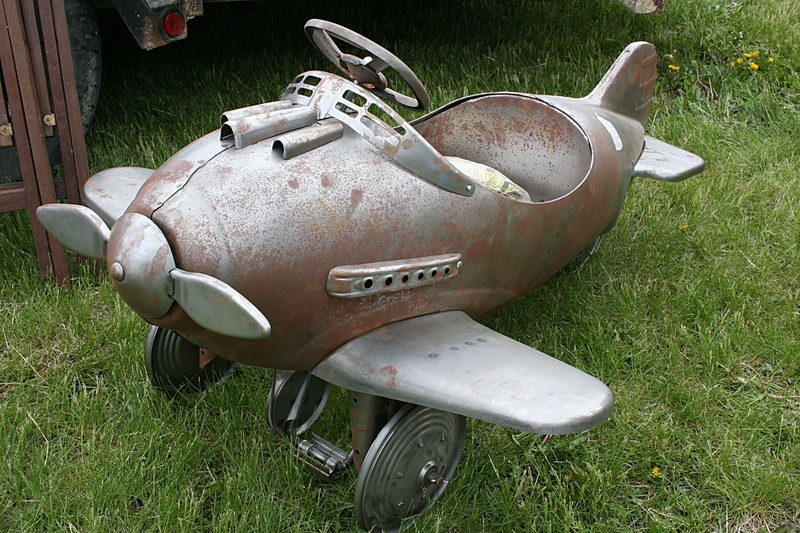 A sweet 1940s vintage plane priced at $1,200. 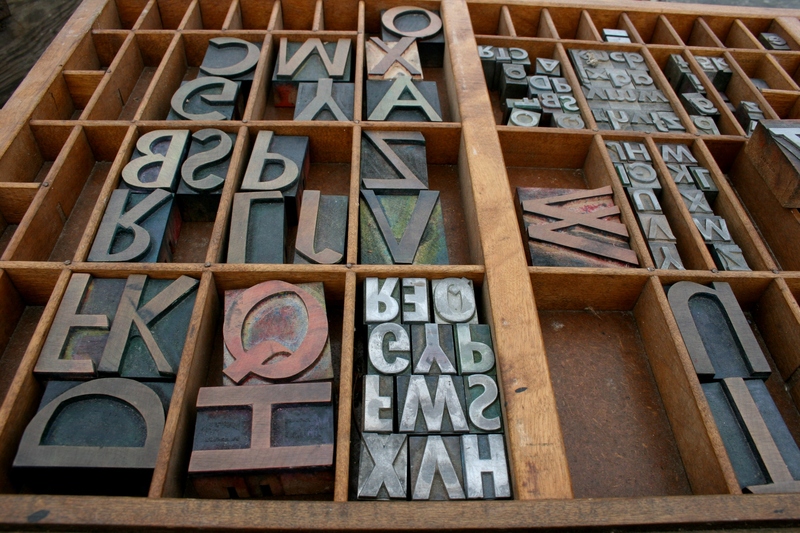 Wood and lead type, some of which I wanted to buy, but didn’t. 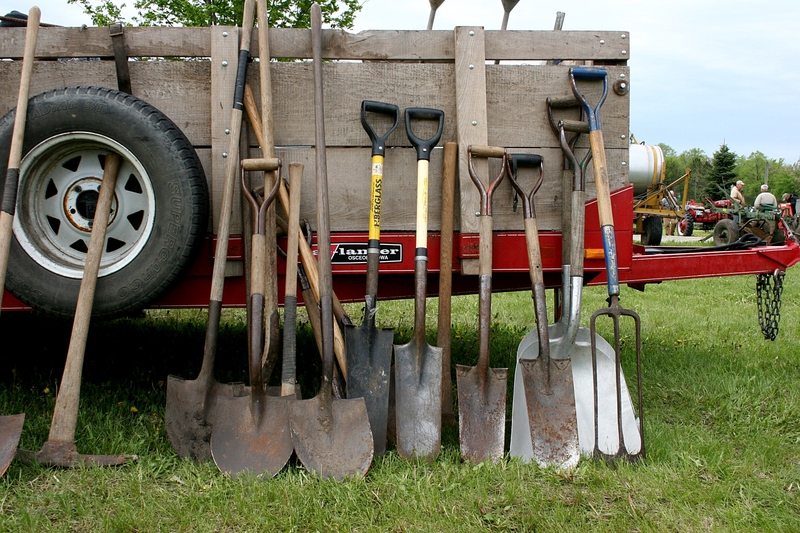 Shovels lined up for the live auction on Saturday. If you can’t find something here that you like, then you’re not digging or searching hard enough or you just don’t like flea markets. The eclectic mix of old stuff is, well, mind-boggling. Riding the old merry-go-round near the front gates. There’s still time to make this event. 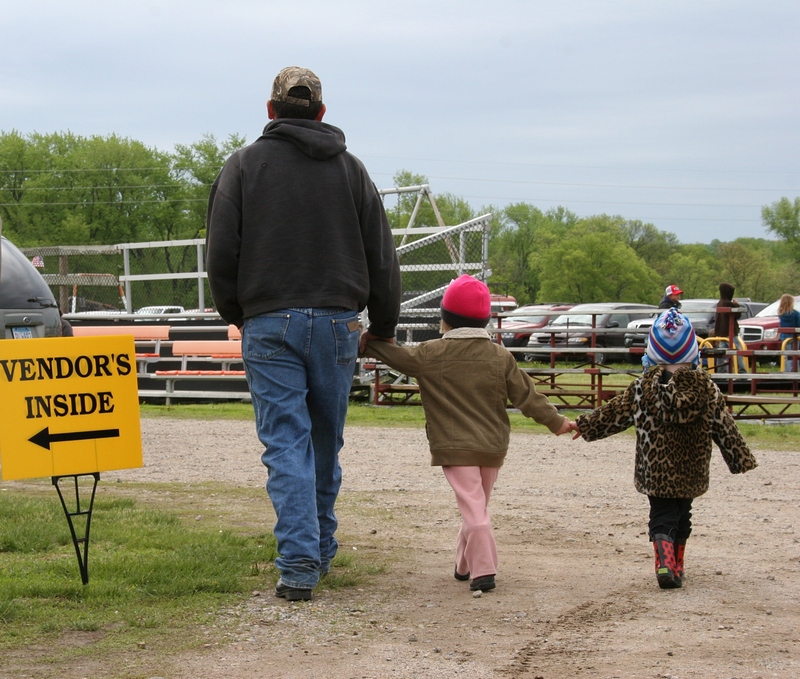 Gates open at 8 a.m. and close at 5 p.m. Sunday. 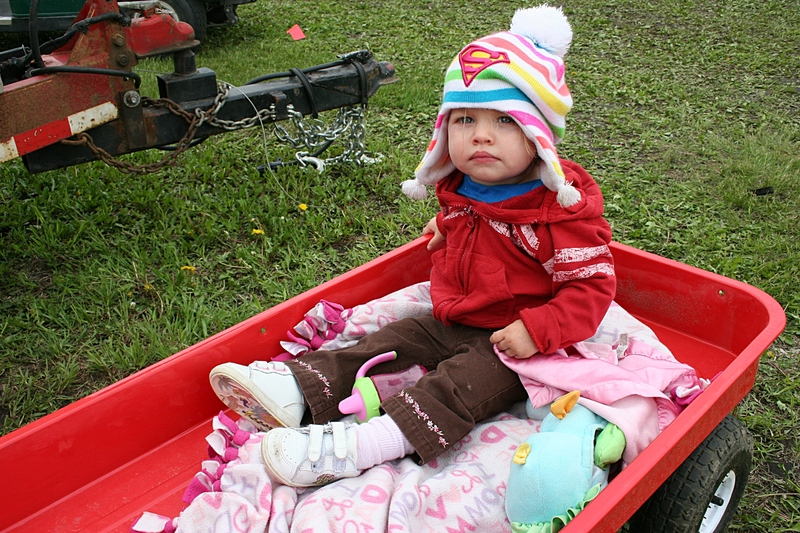 A tractor pull is also slated for 9 a.m.
Eighteen-month-old Marina, bundled up and riding in a wagon pulled by her dad. MORE PHOTOS will be forthcoming in additional posts.